In every course, instructors expect students to learn; therefore, we attempt to be present for learners, and provide enriched learning environments which nurture this learning. However, in online courses developing such environments can be more difficult (or, at the very least, may come less naturally and require more conscious effort on the part of the instructor) and student performance can suffer when compared to on-campus versions of the same course. An important source of this discrepancy might be the reduction in presence, broadly-defined. As such, increasing presence in online courses may eliminate this disparity. In the present study, an instructor created her online introductory psychology course in a manner that increased her presence, more closely approximating that of traditional courses, and confirmed this prediction. As instructors, we hope that students learn the material presented in our classroom. To this end, we plan lectures, activities, and assignments with the expectation that these various learning tools will help students master course content. However, with the increasing popularity of online courses, important adaptations must be made to assure quality instruction. The online learning environment differs in fundamental ways, and some instructors may feel at a loss in terms of how to use this delivery mode to benefit student learning, and may be unaware of the repercussions of their pedagogical decisions in an online learning environment. The amount that students learn (as defined by meeting learning outcomes) and student performance can suffer in online courses compared to on-campus versions of the same course (e.g., Ury, 2004) as has been our experience at the institution from which we will draw our sample. It is important to note, however, that many researchers have also reported significantly better performance in online environments compared to traditional face-to-face classroom environments (see Lapsley, Kulik, Moody, & Arbaugh, 2008; Nguyen, 2015; Shachar & Neumann, 2010). For the instances where students underperform in online environments, there are many possible reasons that underlie this difference, including students feeling as though they are not dealing with a “real” person and thus becoming disengaged and less accountable; this may be due to the depersonalization of the instructor via the computer, which, at its root, is an issue of online teacher presence. The present paper will initially describe how instructor goals in the classroom are achieved differently in online classrooms compared to traditional face-to-face courses. Following this, the importance of presence will be outlined to offer a rationale for the present investigation. Finally, the present study will be described, including conclusions and practical examples of how one can build instructor presence into an online classroom environment. Instructors typically support and guide the learning of their students by scaffolding their development in order to ensure the comprehension and mastery of key concepts. This may come in many formats, from simply providing resources like key readings, to illustrating ideas, to discussing real-life examples, to engaging students in demonstrations or activities where they discover the concept for themselves. Each of these supports the development of learning. However, some of these methods are less easily translated to an online learning environment, especially where exchanges between instructor and student(s) or peer-to peer interactions are concerned. In a traditional classroom, instructors are able to discuss ideas with students collectively as well as individually and can use interactive activities to clarify difficult concepts. Although this can also be done in an online environment, it may lack the social dimension that the same activity would have in a classroom. Furthermore, it can be much more intuitive for instructors to develop engaging activities for the physical classroom than attempt to construct similarly engaging activities for online courses, especially given that our own academic experiences as students were primarily in a face-to-face classroom. This difficulty is partially due to the physical versus virtual presence of the instructor and students. Presence is defined as a sense of being there or being together (Lehman & Conceição, 2010). Clearly, being physically present at the same time and in the same space (i.e., in a classroom during weekly meetings) creates a sense of presence without any additional effort on the part of the instructor or the students. When the online environment is asynchronous, it can be more difficult for an instructor to create this sense of presence, which can lead to important pedagogical shortcomings for students. The most important difference between online and in-person teaching is the separation between the student and the instructor, as well as a lack of connection among students in the class (Lehman & Conceição, 2010). So, online interactions (which are mediated by the use of technology) differ significantly from traditional face-to-face interactions because the online environment is a technological representation of the human instructor (Biocca, Harms, & Burgoon, 2003). Without this perception of the existence of a real person communicating across the computer, there is no sense of presence (Biocca, Harms, & Burgoon, 2003; Garrison, Anderson, & Archer, 2000; Gunawardena & Zittle, 1997). Other shortcomings of the online environment for presence include the loss of connection to classmates and a sense of belonging (Palloff & Pratt, 2007), a perceived lack of accessibility to the instructor (Lehman & Conceição, 2010), depersonalization, and a decrease in accountability (Lehman & Conceição, 2010). Past research has examined presence in the online classroom. It is a well-known fact that humans are social creatures and, as such, require human social interactions. Aragon (2003) points out that we use social interactions to relieve our anxiety in new situations (e.g., striking up a conversation or merely observing others in the same situation) and that these positive social interactions serve to increase our comfort level and reduce our anxieties. Because these types of social interactions are more difficult online (e.g., striking up a conversation), the online classroom can be socially isolating and, make it more difficult for students to feel comfortable in this new learning environment (Aragon, 2003). These interactions are more naturally created in traditional learning environments, and therefore can be inadequate in online courses. These interactions have important implications for student learning outcomes and performance: presence creates a comfortable environment for the learner, which leads to meeting the course learning outcomes (Caspi & Blau, 2008). As such, a sense of presence is also a necessary component for successful online learning (as discussed in Lehman & Conceição, 2010). Evidence for the importance of instructor presence has also been presented by Richardson and Swan (2003), who showed that student perceptions of presence were positively related to satisfaction with the instructor and perceived learning as well as success in online courses. Additionally, although both peer presence and instructor presence were positively related to these variables, instructor presence was a more important predictor (Swan & Shih, 2005). When instructor and/or peer presence is felt in online courses, the result is a sense of classroom community. This sense of community also predicts satisfaction and perceived learning such that a greater sense of community results in greater academic satisfaction and perceived learning (Ni & Aust, 2008). As such, increasing presence in online courses should lead to increased student satisfaction and learning. 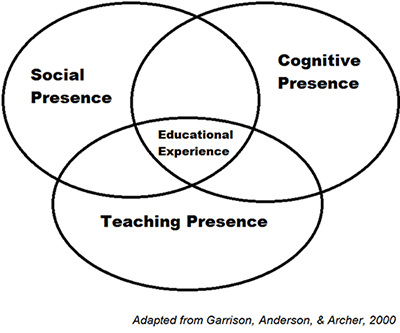 The concept of presence is a multi-dimensional construct, as outlined in Garrison, Anderson, and Archer’s (2000) Community of Inquiry framework. Here, presence has a social, cognitive, and teaching dimension. Social presence refers to peoples’ ability to present themselves online as unique individuals and real people, demonstrating, for example, their personalities. This component relates to students’ abilities to project their personalities in the online environment, emotional expression, social communication, collaboration, as well as group cohesion. Cognitive presence is the term used to refer to the construction of meaning by way of communication, including the exchange of information, and constructing or confirming meaning through discourse. Teaching presence refers to the design of the students’ educational experience, including content and learning activities. This may take the form of direct instruction or focusing discussions, for example. Online communication that is expressive, stimulating, and substantial is an important aspect of creating a sense of presence (Tu & McIsaac, 2002). There must also be a mutual awareness that the technologically mediated exchange occurring in the online classroom environment is between two (or more) humans (Biocca, Harms, & Burgoon, 2003). Creating a sense of presence in online courses is an ongoing process that must continue throughout the course and should begin even prior to the official commencement of the course. Some examples of how instructors can and have increased their presence in online classrooms include sending students a welcome message, providing introductions to students (and from students to each other), limiting class size, orienting students to the course, holding electronic office hours, sending frequent and personalized announcements, providing timely and individualized feedback on assignments, posting to discussion boards, and using engaging videos (Aragon, 2003; Lehman & Conceição, 2010). In online environments, it can be more challenging for instructors to foster a sense of presence, and allow students to learn in a manner supported by their instructor as well as their peers. As a result, student performance may suffer compared to face-to-face delivery of the same course (Ury, 2004). It is possible that students feel disengaged with online learning as well as less accountable since the instructor is depersonalized via the computer. Instructor presence as examined herein is primarily social in nature (as defined in Garrison et al.’s Community of Inquiry Framework), where the instructor being a “real person” is evident in her online interactions. However, teaching and cognitive presence also play an important role. As outlined below, the course modifications introduced in the present experiment will focus on social presence. The present study seeks to investigate whether increasing presence in an online course, might reduce or even eliminate differences between online and on campus courses. Three sections of an introductory psychology course were compared: the online section had 25 students; two on-campus sections had a total of 28 students (9 and 17, respectively). All three sections used the same assignments and exams. The on-campus instructors made no special changes to their delivery methods and taught their course as they previously had. Given the importance of presence for student performance (Richardson & Swan, 2003), the online instructor attempted to create a strong sense of presence in her online course that approximated (or perhaps even exceeded) that of the traditional face-to-face course. Additionally, the instructor made use of multiple types of interactive strategies (Lehman & Conceição, 2010) both between instructor and student and among students. The next section outlines how the instructor increased social, cognitive, and teaching presence in her online course. Figure 2 - Screenshot of introductory video. 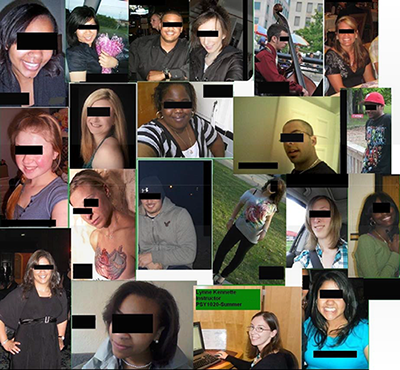 During the second week of class, the instructor created a labelled class collage with the photos collected during the introductions (Schubert-Irastorza, Koeller, & Richards, 2010) and posted this on the discussion board, as well as emailed it to all other enrolled students (Figure 3). Beginning this same week, weekly discussions were posted on the LMS discussion board and the instructor responded to most of these weekly posts. Some of the earlier discussions were used as ice-breakers and to encourage interactions among students (“What’s your favorite ice cream?”; “If you could live in any sitcom (past or present) which would it be and why?”). Later discussions were related to academic material (e.g., “Who is your favorite psychologist and why?”) The instructor would summarize (when appropriate) the results of these discussions and share them with the class through the discussion board or by posting an announcement in the course Newsfeed (e.g., Figure 4 shows an example for the class’ favorite psychologist). Figure 3 - Class collage (N.B. Students’ eyes have been blacked out to protect student privacy; this was not done when originally posted for private class access). 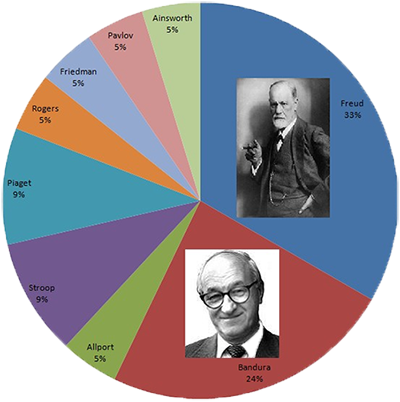 Figure 4 - Summary of a weekly online discussion (“Who is your favorite psychologist and why?”). Qualitative comments gathered during a semi-structured reflection assignment asking students to reflect on their online learning experience suggested that students felt positive about the online course (which they originally feared would be dry and impersonal). They enjoyed the interaction with their classmates, and many noted that the instructor seemed like a real person, rather than a machine. In line with our hypothesis, there were no significant differences between online and on- campus student performance. This was the case for final grades (t(43) = 1.527, p = .134), each of the four exams (p-values ranging from .144-.739), and each of the four written assignments (p- values ranging from .232 - .852). Although this is a common finding in the literature, there is typically a difference at the institution sampled here in student performance between online and face-to-face courses, whereby students in face-to-face courses outperform students in online versions of the same course (but see the recent meta-analysis by Shachar & Neumann, 2010 demonstrating the opposite pattern in 70% of cases). To confirm that lower performance in these online psychology courses tends to occur at this institution, the present data were compared to a previous semester’s online student data (taught by the same instructor, but without the measures described above to increase presence). The mean final grade in this earlier online course did show significantly lower final marks when compared to the on-campus courses (t (57) = 2.75, p < .05) suggesting that, at least for the student population investigated here, online students’ grades are lower than those of the students taking the same course face-to-face. Taken together, these differences suggest that the addition of presence in an online course may lead to improved student performance; for the students enrolled in the online course with greater presence, exam performance and final grades were equivalent to those in the face-to-face courses. Of additional interest, the mean final grade in the earlier, lower online presence semester was 67.54%, whereas the mean final grades in the recent online semester (which incorporated additional efforts to increase presence) was 76.81%. Although this difference did not reach significance (t (56) 1.36, p = 1.78), the difference is quite large, and appears to be intuitively different. This lack of significance is likely due to low enrollment which provided a small sample size relative to the distribution of grades (n = 33 and n = 25) resulting in inadequate power (estimated power of .28, post hoc). In order to have adequate power to detect an effect here, we would have needed a much greater sample size (N ≈ 115). In spite of this, these analyses support the conclusion proposed herein that increasing the instructor’s presence online is beneficial to student learning. The significant difference in performance between online and face-to-face courses was eliminated when the instructor increased her online presence: final grades were significantly lower in the online course compared to the face-to-face course when the instructor taught the course as she normally had, but were no longer significantly different the following semester when she increased her presence online in the ways described herein. Student learning outcomes (operationalized as grades) in an online class do not differ from those in a traditional face-to-face delivery model when the online instructor creates a strong sense of presence. Although the focus of the modifications in the present study were on social presence, teaching presence and cognitive presence were also increased compared to previous iterations of the course. Given the increasing prevalence and popularity of online teaching formats, instructors need to put in extra effort to ensure online students receive an equivalent learning experience as they would experience in a face-to-face delivery mode. One way to achieve this, we suggest, is to increase presence. Interested readers on this topic may refer to the book by Lehman & Conceição (2010) for guidance on how to build presence into an online course. We wish to extend a special thank you to Margo Bowman, Wayne State University, for her continuous mentoring and guidance on issues related to teaching and learning and to A. Michelle Wright for her participation in the project. Lapsley, R., Kulik, B., Moody, R., & Arbaugh, J. B. (2008). Is identical really identical? An investigation of equivalency theory and online learning. The Journal of Educators Online, 5(1), 1-19. Lehman, R. M., & Conceição, S. C. O. (2010). Creating a sense of presence in online teaching: How to “be there” for distance learners. San Fransisco, CA: Jossey-Bass. Nguyen, T. (2015). The effectiveness of online learning: Beyond no significant difference and future horizons. MERLOT Journal of Online Learning and Teaching, 11(2), 309-319. Ni, S. F., & Aust, R. (2008). Examining teacher verbal intimacy and sense of classroom community in online classes. International Journal on ELearning, 7(3), 477-498. Palloff, R., & Pratt, K. (2007). Building online learning communities: Effective strategies for the virtual classroom. San Francisco, CA: Jossey-Bass. Richardson, J. C., & Swan, K. (2003). Examining social presence in online courses in relation to students’ perceived learning and satisfaction. Journal of Asynchronous Learning Networks, 7(1), 68-88). Schubert-Irastorza, C., Koeller, M., & Richards, J. (2010, October). Magic tricks for increasing student engagement in your online course. Workshop presented at the meeting of the International Society for Exploring Teaching and Learning, Nashville, TN. Shachar, M., & Neumann, Y. (2010). Twenty years of research on the academic performance differences between traditional and distance learning: Summative meta-analysis and trend examination. MERLOT Journal of Online Learning and Teaching, 6(2), 318-334. Swan, K. & Shih, L. F. (2005). On the nature and development of social presence in online course discussions. Journal of Asynchronous Learning Networks, 9(3), 115-136. Ury, G. (2004). A comparison on undergraduate student performance in online and traditional courses. Journal of Computing Sciences in Colleges, 19(4), 99-107. Lynne N. Kennette, is a professor of psychology in the School of Interdisciplinary Studies and the program coordinator for General Arts and Science- Liberal Arts at Durham College, Oshawa, Ontario. Bibia R. Redd, is an instructor at the University of North Georgia, Gainesville, Georgia, USA.